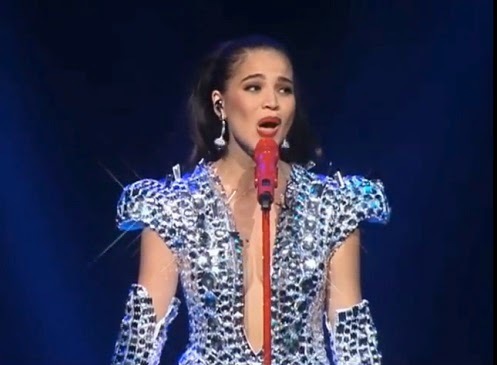 Manila, Philippines - Filipino-Australian Kapamilya actress Anne Curtis sang the Oscar-winning hit "Let It Go" during her concert titled, "The Forbidden Concert: AnneKapal" held on Friday at the Smart Araneta Coliseum. The It's Showtime host has finally answered request from her fans to sing Idina Menzel's popularized song from Disney's 2013 hit animated film "Frozen." Meanwhile, Anne Curtis became emotional as she had responded to her critics during her second concert but the crowd reacted with cheers and applause in an effort to encourage the actress. Idina Menzel's performance of the song touched the hearts of many Filipinos, prompting some to come up with their own versions of the song. Aside from Anne, other Filipinos who have performed 'Let It Go' include Popstar Princess Sarah Geronimo and the Asia's Songbird Regine Velasquez.